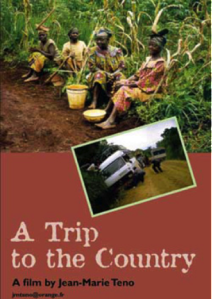 A Trip to the Country is a voyage in search of the illusion of modernity, which haunts Cameroonian society; a kind of "tropical modernity" which can be summarized as follows: Everything from Europe is modern, while all things local are archaic and must be discarded. “AGAINST ALL ODDS, AFRICANS TELL THEIR STORIES ON FILM.” The Toronto Star. (August 25, 2000 , Friday, Edition 1 ): 727 words. LexisNexis Academic. Web. Date Accessed: 2014/05/08.